So maybe two years ago I was at the Philadelphia International Flower Show and one of the vendors was this French women selling nothing but Lilies. As the show takes place over the winter they were all in the form of bulbs. I forget how much they cost but apparently I came home with five of them. Last year they didn't do anything; this year they're up with force and flowering. Dear god! This monstrous flower is larger than any Amaryllis I've ever grown. 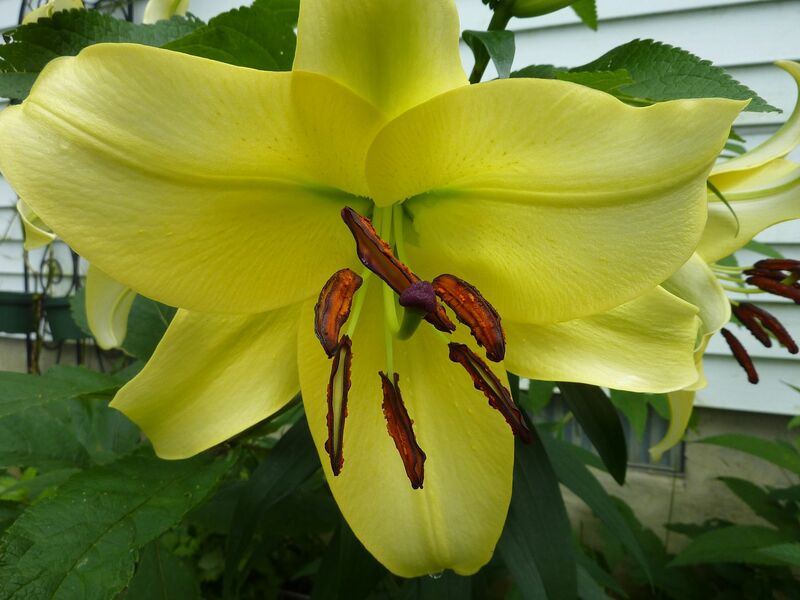 It's supposed to be some kind of lily but the flower is enormous, and the anthers are longer than my fingers. My brother's bride to be took one look at them and demanded she walk down the isle with a bouquet of them.... tragically the wedding is in October so that's not really doable but I'm sure a floret will have something nice. So this clearly isn't a native plant. True they look lovely and any gardener would be happy to have them growing in their garden. But as I'm committed to the native theme I feel it might be best if I dig up the bulbs later this winter and give them to my brother's bride as a gift. She seemed to enjoy the flower more than me and I know she loves cut flowers. They're fragrant by the way. Personally I try to garden with the theme that it's one thing to be pretty but quite anther to be pretty useful. Right now I'm at a loss to imagine what could pollinate them. Maybe half a dozen swallowtails and hummingbirds could probably fit in it all at once to sip nectar. There's enough pollen on the anthers to stain everything they touch. Any who, I'm sure she'll be thrilled with the gift.